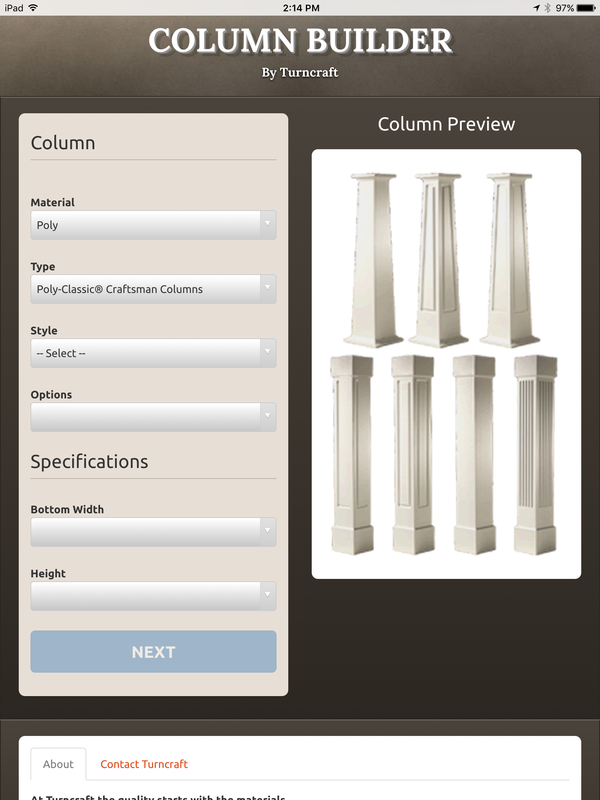 At the Cheap Column site, we give you great prices on architectural columns. That doesn't mean we skimp on quality, we just save money on things like company cars, expensive offices and this web site. If you're a pro, you know what you want, so we don't waste time with a wordy sales pitch, we just give you a product description, the vital dimensions and a price quote. This page shows prices for Poly-Classic® (PVC), non load bearing, paint grade, square, non-tapered Craftsman column wraps with double raised panels on the shaft. These columns have a Prairie cap and base. Other caps and bases are available. Our customers have been extremely happy with the look, feel and durability of Turncraft's Craftsman product line. Craftsman columns, pedestals and newels are non load bearing and ship flat packed for field assembly around a structural post. We believe there are many benefits to these non structural column wraps. Craftsman columns are lighter, less expensive and cheaper to ship than load bearing columns. In addition, they are milled rather than molded, so details are a bit crisper. Decorative load bearing columns require special care during the rough construction phase to prevent cosmetic damage. With a decorative wrap you can install an inexpensive structural post, such as pressure treated or steel, during construction and then install your Craftsman wrap during the trim phase. The shaft comes in 4 pieces with mitered ball and socket edge joints for easy assembly. The cap and base trim comes separate pieces for easy assembly. Most Craftsman columns are made to order in about 3 weeks. Because most Craftsman products are made to order, and cut with CNC routers, custom sizes and configurations are available. All Craftsman products are available in the wood of your choice on special order. We do not recommend the wood option for paint grade applications; the cost is higher and the PVC holds up better outside. Because the panels are cut with a router, inside corners are radiused (rounded), tighter radius (1/8") cuts are available for a small up-charge. 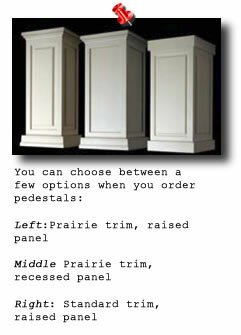 Craftsman columns look great on pedestals and we give you several styles to choose from. Pedestals with plain panels are the cheapest, but for a few more pesos, you may prefer the the look of the raised panels or recessed panels. Recessed panels are the most expensive because they require the removal of a lot more material during production. 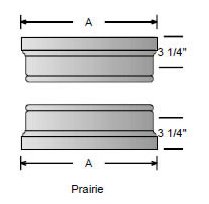 For this 10-inch 8-foot craftsman column with double raised panels, Prairie cap and base. Price goes down for quantity orders. As you see, our prices are based on quantity purchases. Sales tax is collected on California sales. Shipping is not included in the price. To get a quote that includes the shipping cost, click on the Email Quote with Shipping button in the price table. That opens an email form. If you provide the quantity of columns you need and your zip code, we'll give you a quote that includes shipping. We won't share your email with anyone, not even our marketing guy.